This indispensable guide to the next 20 years of global turmoil and transformation weaves the full spectrum of disciplines--history, political economy, ecology, energy, marketing, investing, health, and the psychology of happiness-- into a uniquely comprehensive understanding that offers every thinking person practical principles for not just surviving but prospering in the decades ahead. Buy direct from the publisher with a $4 discount (20%) off the $19.95 retail price (+ shipping). 1. The link will take you to createspace.com; open an account (standard e-commerce). 2. When prompted during checkout, enter this discount code: JPW86XRB. 3. Sales tax is collected as per your state's laws. Download the Kindle ebook for $9.95 (for the Kindle reader or any PC, smartphone, iPad, etc). You can also give a Kindle ebook as a gift. Since I am self-supporting and do not draw a paycheck from any investment firm, university, think tank, government agency or corporation, the few dollars I earn from your purchase of the book are important, especially considering that books not promoted by large publishers are fortunate to sell a few hundred copies. If sales of this book are typical, my compensation for the year it took to write the book will be modest indeed. The exchange value of the full-version print book ($19.95) is approximately one meal at a fast-food restaurant or two tickets to a first-run movie. The price of the ebook (downloadable) versions is $9.95, less than one small takeout cheese pizza. It is a peculiarity of our culture that people will spend $20 for two tickets to a 90-minute movie or on a restaurant lunch for two, yet a $20 book is "too expensive." Is $20 for a book which might change your understanding of society, economy and prosperity really "too expensive"? If you cannot afford to buy the full version book, email me the contact information of your local library; perhaps they will buy one or accept a donated copy from me. 3. Ask your library to order a copy. 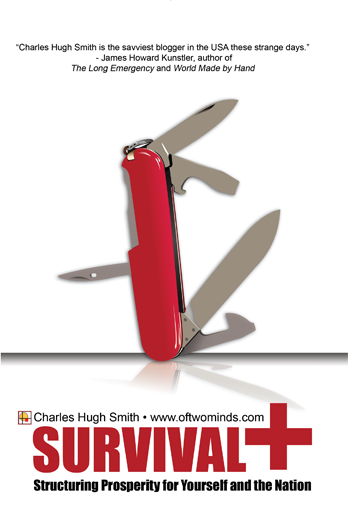 Reader feedback persuaded me that a 400-page book is a daunting prospect for many, and so I decided to create an Introduction to Survival+ that is only a third the length (48,000 words, 134 pages) of the full version. 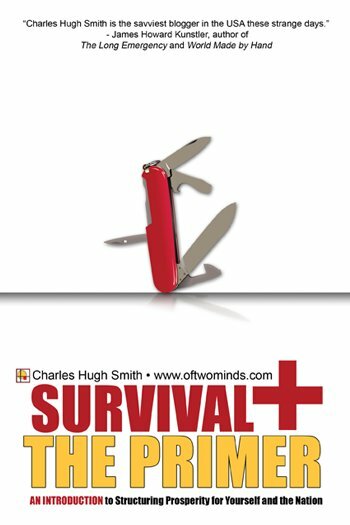 It is not a summary--there is simply no way to summarize 396 pages into 134 pages--but The Primer serves to introduce key Survival+ concepts and principles for a modest cost: $5.95 for the ebook or $9.95 for the print version. Those seeking a quick read will find The Primer fits the bill. It is both a stand-alone work and an introduction to the full version. Copyright 2008-2012 Charles Hugh Smith all rights reserved in all media. No reproduction in any media in any format (text, audio, video/film, web) without written permission of the author.